Jive and Darcy at the Delatite River, Mansfield. 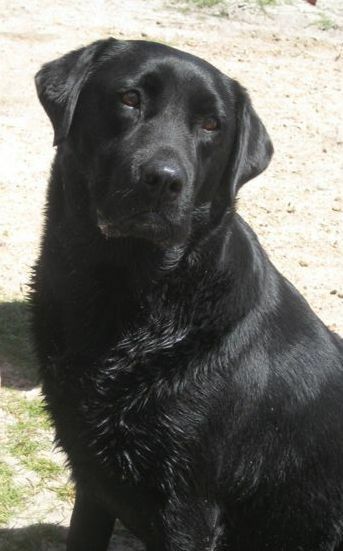 "These words seem to portray the Labrador and none other" Lorna, Countess Howe. 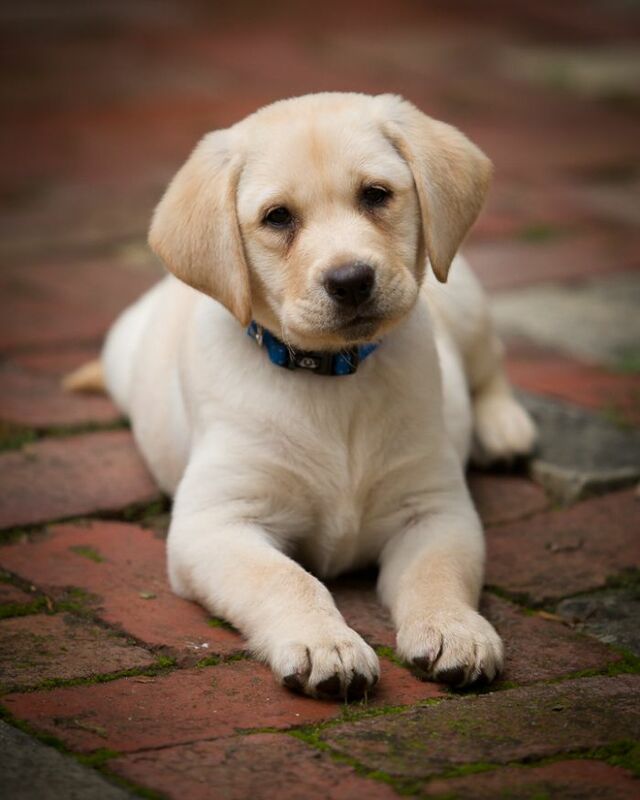 If you would like to send me an expression of interest about puppies please go to the Puppy Enquiry page! As most regular visitors to our website are aware, our photo of Jive and Darcy has been our header photo since we began our webpage. 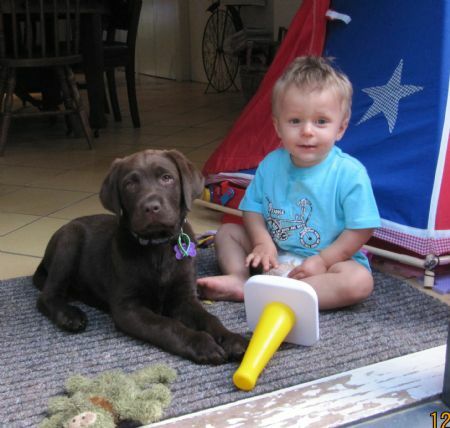 I love this photo because Jive has been a valuable part of our breeding program as well as much loved family member. 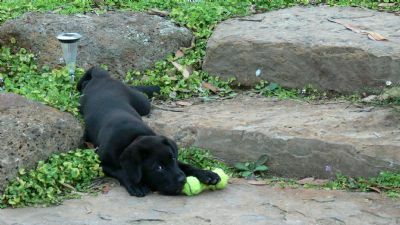 Jive now lives with Serena & Bruce who send me many updates and photos showing Jive living in the life of luxury. UPDATE: After 6 wonderful years with Serena and Bruce, Jive passed away aged 13. Our lovely black "Sparrow" is now with the family.... sharing the love! Darcy has lived with his family for many years. We reluctantly parted with this gentle soul as he didn't quite meet our requirements for breeding from a 'breed standard' point of view. I was alerted to the fact that Darcy was still in the picture on your website, so had to have a look! He is about 8 and a half now and the most gorgeous animal ever. He has the most beautiful nature, is loved to death by his human sisters & brothers (and mum & dad) and is looking forward to the cold ocean swims down at Lorne over the holidays. Tabs for pages are on the top right hand side of this page. Please scroll right if you cannot see them. Gunnerson Kiki Upsy Daisy at 10 weeks. Born April 2017. 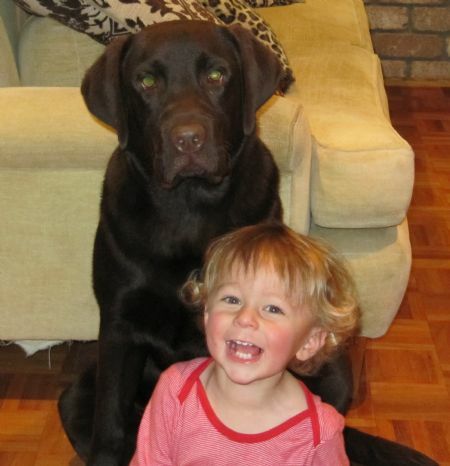 Welcome to Gunnerson Labradors web site. 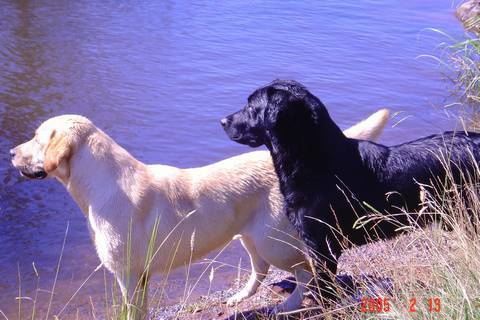 As breeders of chocolate, black and yellow labradors we hope that you will experience the beauty of the labrador as we do every day. Please enjoy your visit. Feel free to have a look around and contact me if you would like to know more. This beautiful girl 'Ajieni' (pronounced Annie) was my first ever Labrador. 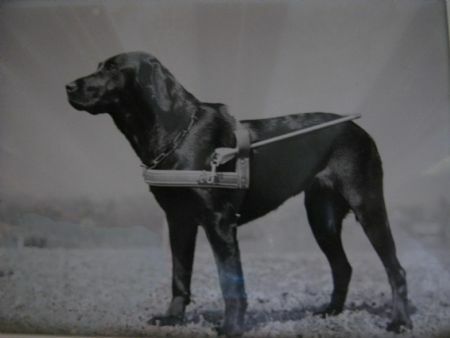 My parents decided to puppy walk a guide dog puppy and so in early 1970 Ajieni came to live with us. As a companion for Ajieni my father came home with a black lab X (pointer we think) for which he had paid $4 from the local pet shop. So Ajieni, Kandi and the black cat Michael were our companions. Both dogs won our hearts and the thought that we would have to give Ajieni back was too much for my brother, sister and me so, being very young, we decided that if we taught her things she wasn't meant to do she would fail her training and then be returned to us. Here began our ploy........we walked her on the right side not the left, we encouraged her to jump up on us, we taught her to bark, anything we could think of. (These days the guidelines for puppy walking a guide dog are strict and enforced however in 1970 things were more relaxed and visits by the handlers were few.) When the inevitable happened and Ajieni was collected from our home the tears ran freely........I will never forget her trusting face looking back at us out the rear window. Being the magnificent animal that she was, she passed her training with flying colours and went on to do the job she was bred for. We never saw her again but 8 years on I did write to The National Guide Dog Centre in Kew and ask, if upon her retirement, we could be considered as her old age care givers. Their reply was as I anticipated, she was to be cared for by an extended family member. Thanks Ajieni for my love of Labs! When we have initial contact with people the majority know that a Labrador is the breed of dog they want as a their companion. However there are some people who are still unsure and, responsibly, are researching which breed of dog will suit them. 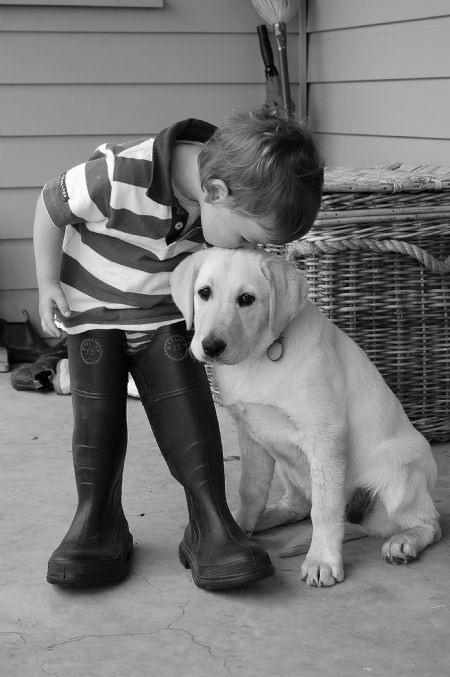 The Labrador is renowned as a beautiful "family" pet; loyal, even tempered, very trainable and of course with a loving nature. 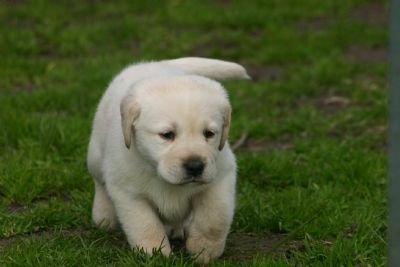 To be certain of getting these characteristics in your Labrador make sure your pup comes from a registered breeder. 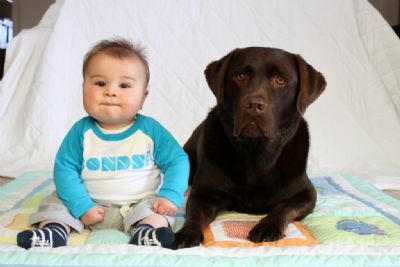 To see the bond between one small boy and his dog click on the link below. 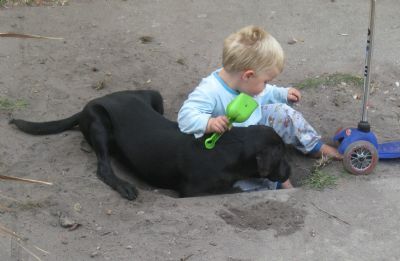 Remember children and dogs together should be supervised at all times, regardless of the breed. Fudge (10 weeks) and Tully (14 months) chill together. November 2009.
no lawn and a black dog never far away. Jett turns 5 (August 2011) ::::::::::: see "our boy" page ! For 1st birthday photos of Scout's litter......... go to Scout and Ozzie's page. Scroll to page bottom. This beautiful girl below is Maggie owned by Angela D.
Angela emails me regularly with updates and photos..............she thinks Maggie is the best. 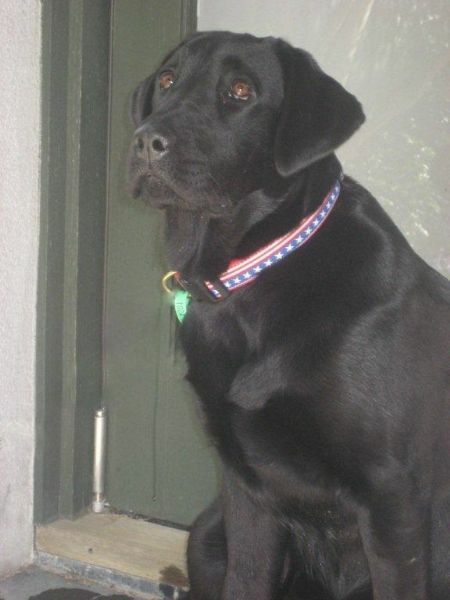 Our loss was Angela's gain since Maggie has a magic temperament and true labrador looks. Update April 2010........Angela has adopted another Gunnerson Lab....Daisy. After one week Angela says "Daisy is lovely and doing all the right things. We are thrilled." You were a tiny little labrador when we brought you home. Now you are larger than life (30 kgs of you) and you give us lots of fun, laughs and love. Some of the things you have decided we no longer need are : number plates, number plate covers, 2 garden hoses, 1 garden hose reel that was attached to a brick wall, 3 dog beds, 1 rose bush, 2 gardenia bushes.....at least 5 indestructible dog toys (not,) countless screwdrivers from the garage, ignition switch fron the BBQ, a garbage bin, pair of thongs, air conditioner cover, watering system in the garden, a water pump.....and that is just the first year! Our trailer has never been empty since the day you came. We love you heaps Tilley! I can see the devil in her eyes!